in this large interfaith WebRing. Advertising | Buddhas | Discuss | Gohonzon | Gosho | HBS | Independent | Inmates | Kempon | Lotus Sutra | Nichiren | Nipponzan | NShoshu | NShu | Pilgrimage | Prayer | Pure Land | Queers | RKK | Reiyukai | SGI | Stupas | Sutra Library | Tales | Tantric | Tendai | Theravada | WebRings | Women | Zen | Misc. | What'sNew? The Lotus of the Wonderful Law, or the Lotus Gospel: Saddharma Pundarika Sutra: Mao-Fa Lien Hua Ching by William Edward Soothill. Paperback Mar 1996. The Drama of Cosmic Enlightenment: Parables, Myths, and Symbols of the White Lotus Sutra by Sangharakshita. Paperback Aug 1996. The Wisdom of the Lotus Sutra: A Discussion by Daisaku Ikeda, Daniel Nagashima, Haruo Suda. Paperback Jun 2000. The Wonderful Dharma Lotus Flower Sutra by Hsuan Hua, Bhikshuni Heng Yin (Translator). Vol 1-10 [Chptrs 1-13], Vol 11 [Chptr 14], Vol 12 [Chptrs 15-16], Vol 13 [Chptrs 17-19], Vol 14 [Chptrs 20-24], Vol 15 [Chptr 25], Vol 16 [Chptrs 26-28]. The Lotus Sutra by Numata Center for Buddhist Translation & Research. Hardcover Dec 1993. Tao-Sheng's Commentary on the Lotus Sutra: A Study and Translation (Suny Series in Buddhist Studies) by Young-Ho Kim. Paperback Dec 1990. Hardcover Oct 1990. 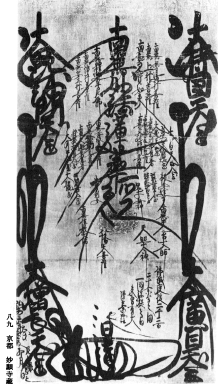 A Guide to the Threefold Lotus Sutra by Nikkyo Niwano. Paperback Aug 1982. Introduction to the Lotus Sutra by Shinjo Suguro, Daniel B. Montgomery. Paperback Sep 1998. Lotus Sutra Poems by Robley Whitson. Paperback Jul 1995. Paintings of the Lotus Sutra by Willa J. Tanabe. Hardcover Aug 1988. Art of the Lotus Sutra: Japanese Masterpieces by Bunsaku Kurata (Editor). Hardcover Aug 1987. The Lotus Sutra in Japanese Culture by George J. Tanabe, Willa Jane Tanabe. Hardcover Jul 1989.